Stoneware mug with printed design depicting man drinking a pint of beer labeled "non-alcoholic." 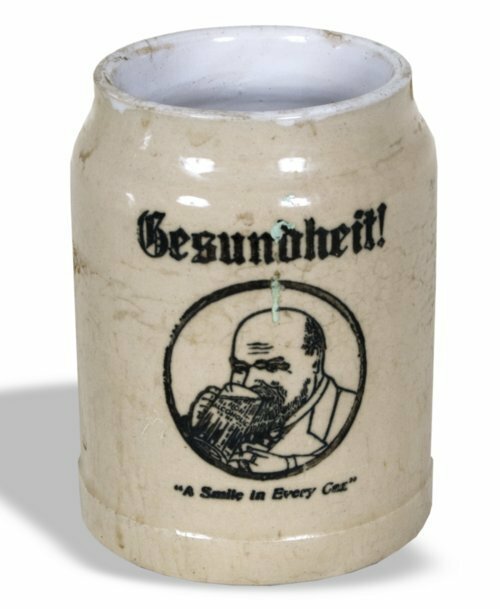 The word "Gesundheit" (meaning "good health to you") and its accompanying image are associated with the Neustadtl Brewing Company of Stroudsburg, Pennsylvania (1933-1935). The mug was owned by Frank Haucke (1892-1977) of Council Grove, Kansas. Haucke attended Kansas State University for one year before World War I, where he served with the New York National Guard Ambulance Company 108 as a Sergeant in France. He was the 1930 republican nominee for Kansas Governor and was the Kansas State Commander for the American Legion.